Used for thousands of years, thyme is thought to have first been introduced as an antiseptic around 3,000 B.C. in Sumatra. Favored by the Greeks, Egyptians and English, the herb is still popular today. In fact, thyme tea is used medicinally for everything from bronchitis to agitation. Thyme, a Greek word meaning to fumigate, is an ideal name for a plant so profoundly aromatic. A member of the mint family, thyme has over 350 subspecies and is a perennial plant that is fairly resistant to drought. Species of garden and wild thyme are found around the world, most likely spread throughout Europe by the Romans. The herb features narrow stems, small flowers and typically has evergreen leaves of a greenish gray color that are slightly hairy. Both garden and wild varieties of thyme are popular, including unique hybrid varieties such as orange and lemon thyme. What is Thyme Tea Good For? With such a wide range of uses, thyme tea offers a simple, healthy and affordable solution for many common ailments. What Does Thyme Tea Taste Like? While there are many varieties of thyme, the herb typically offers a very earthy rich flavor with subtle mint undertones. Some hybrid varieties of thyme offer a citrus flavor that is favored by chefs and tea lovers. 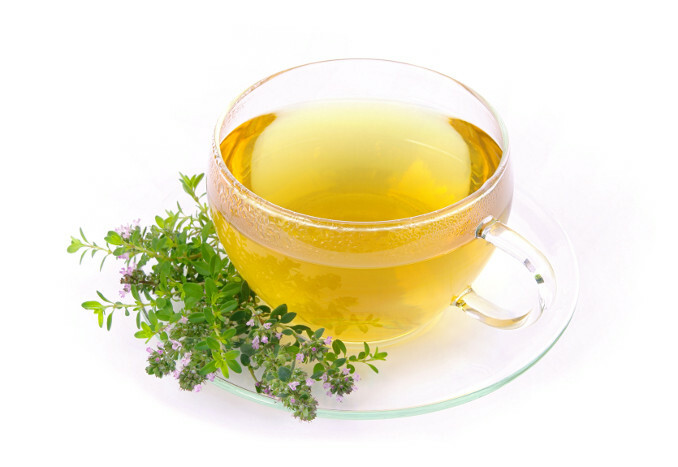 Generally, thyme is not considered to be overwhelming and pairs well with other herbs for customized herbal tea blends. Mint or peppermint – As thyme has a slightly naturally minty note, pairing with mint teas really brings out the less obvious flavor. Mint is especially wonderful for stomach upset and aromatherapy. Chamomile – Use thyme and chamomile together to soothe nerves and promote a healthy immune system. Chamomile offers a light flavor that is versatile enough to pair with almost any tea. Lemongrass or other citrus teas – Citrus flavored thyme is gaining popularity. Try pairing traditional thyme with lemon or orange teas for a bold clean finish and delicious vitamin C boost. Mushroom teas – With its earthy flavor, thyme is wonderful when paired with mushroom teas like chaga, known as an ideal coffee replacement. Rich in vitamin C, vitamin K and manganese, thyme has been used in Chinese medicine for centuries. In traditional Chinese Medicine or TCM, thyme is considered a qi building herb. Qi is the vital life energy, responsible for all functions of life including growth, the immune system, metabolism and organ function. Typically, those with a qi deficiency crave sweet foods, may have a lowered body temperature, become cold easily, feel fatigued and experience bloating. Antiseptic action- The thyme plant is rich in thymol, a natural antiseptic. Thymol is found in name brand mouthwash and popular linaments to fight bad breath, treat dental ailments and kill germs, as well as treat baldness (WebMD). Cardiovascular effects – Animal studies, reported in Plant Foods for Human Nutrition, show that wild thyme commonly found in the Mediterranean lowers cholesterol and reduces heart rate, offering multiple benefits for cardiovascular health. Antioxidant properties – Multiple chemical properties of thyme show strong antioxidant effects including free radical and nitric oxide scavenging. Thyme is rich in a variety of flavonoids including apigenin, luteolin, naringenin and thymonin. Antibacterial action – A study reported in Medicinal Chemistry showed thyme to be effective against many infectious bacteria including Staphylococcus, Pseudomonas genera, Enterococcus and Escherichia. Cancer protection – Different subspecies of thyme have been shown to cause apoptosis or cell death of cancer cells. Although more research is needed, initial reports shows that wild thyme induces cell death in relation to breast cancer, while mastic thyme may protect against colon cancer. Available in powdered, fresh or dried form, thyme offers an abundance of vitamin A and C, copper, iron, manganese and dietary fiber. Typically, thyme stores better than many herbs, making it ideal for medicinal use. Rich in thymol, thyme is known as a biocide, which by definition is a substance intended to destroy or render harmless any harmful organism by chemical or biological means. Are There Any Side Effects from Thyme Tea? Pregnant or breast-feeding – While average food amounts of thyme, such as that found in tea, are thought to likely be safe for pregnant or breast-feeding women, it is not known if medicinal amounts are safe, as no human studies are available. Babies and children – There are no current studies available on the effect of thyme on babies, but it is commonly used to treat colic. Thyme is thought to likely be safe for children in food amounts. Medicinal amounts may be safe when used for a short period of time, although it is always best to check with a pediatrician. Oregano Allergy – Individuals who have an allergy to oregano or any species of plant in the Lamiaceae family can potentially have an allergic reaction to thyme tea. Prescription Medications – WebMD warns that thyme can reduce the effectiveness of blood clotting pharmaceuticals (anticoagulant and antiplatelet medications). Particular medications that are known to interact negatively with thyme include aspirin, Plavix, Cataflam, Advil, Motrin, most naproxen, Fragmin, Lovenox, heparin and warfarin. 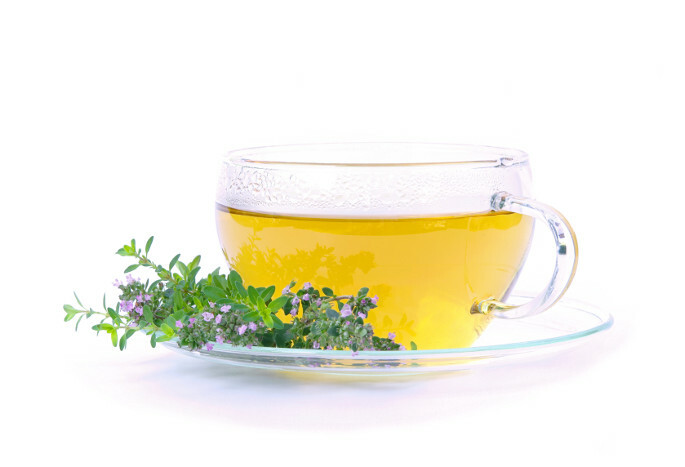 Any Surgery – Thyme and thyme tea should be avoided by anyone undergoing surgery, as it can lead to excessive bleeding during and after the procedure. It is best to stop using thyme at least two weeks before surgery is scheduled. Hormone Sensitive Medical Conditions – Lastly, those with conditions that are sensitive to or worsened by estrogen such as breast cancer, uterine cancer, ovarian cancer, uterine fibroids and endometriosis should avoid thyme altogether, as it may act like estrogen in the body. Currently, there is not enough research available to recommend a proven safe or effective dose of thyme for adults or children, although the amount of thyme found in teas is considered likely safe for most people, as it is not a medicinal or concentrated amount. Steep one tea bag or one to two grams of thyme leaves in approximately a half cup of boiling water for up to 10 minutes. For a customized tea, blend other herbs such as chamomile or mint in equal parts. For bronchitis or upper respiratory infection, allow the tea leaves to steep the full 10 minutes, releasing the full potential of the chemical compounds found in thyme. Warm tea bags may also be applied to acne or fungal infections to provide relief. Thyme tea is available in most health food stores or organic markets, along with fresh thyme for a favored homemade recipe. Popular brands of thyme tea include Yogi, Buddha Teas, Good Nature and Celebration Herbals in packet form, while Tea Haven and My Spice offer leaf thyme for teas. Virtually anyone can improve their overall physical, mental and spiritual wellbeing by adding thyme tea to their diet. Great as a staple year round, thyme tea is especially beneficial during cold and flu season as a preventative measure or holistic remedy. Thyme has even been found to help weaken antibiotic resistant strains of bacteria. From seniors with high blood pressure to overworked parents, thyme tea is a healthy alternative to caffeine or sugary sodas and sports drinks. Perfect for a blustery winter evening or as a pick-me-up during cold season, thyme tea is full bodied and aromatic. Aside from its vast healing properties and ability to ward off fungal and bacterial infections, thyme offers a singular level of comfort and warmth with the first sip. Truly a life giving or qi tea, the unique flavor of thyme boasts a strong and essential element, reconnecting the drinker with the goodness of the earth. In the Middle Ages, thyme sachets or sprigs were placed under the pillow to ward off nightmares. Known as an antiseptic, thyme was used in times of war to prevent the spread of disease, including World War I. In ancient times, people drank a thyme infusion on Midsummer’s Eve, believing it allowed them to see fairies.